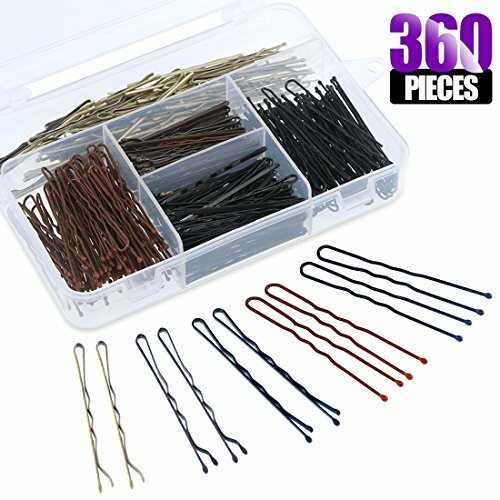 ✔ 1, A large number hair pins, The package includes 360 pack metal hair pins, enough for your spare and replacement in daily, you also can share them with your friends; They are great for middle or long hair. ✔ 2,Reasonable design, The hair pins have little round tips at both ends, can protect your hair from scratching, will not hurt your hair, with wave design of each hair pin, they are elegant and beautiful, very useful in the life. ✔ 3, Convenient to carry, These golden hair pins are packed with a clear box and storage bag, which is convenient for you to store and carry when you go out for work or traveling. ✔ 4, The best costomer service.If you have any questions during the use of the product, please feel free to contact us, we will help you solve all your problems as soon as possible, to provide you with the most satisfactory shopping experience. ✿ HIGH QUALITY ---- These hair pins are made of good quality metal and not easy to break; No easy to fade after applying for a long time. After a long period of use, there will be slight fading.This is normal. Please do not mind. ✿ USEFUL TOOLS ---- The hair pins have little round tips at both ends, can protect your hair from scratching, will not hurt your hair, with wave design of each hair pin, they are elegant and beautiful these hair pins measure approx.5 cm/ 2 inches in length; They are useful to make many kinds of hairstyles, good for holding your hair safely. ✿ WIDE APPLICATIONS ---- Great for up-dos and all-day event wear such as weddings Heavy duty bobby pins for dancers and other high-impact performers, Great for all types of hair, Create professional looking evening styles or casual day looks. ✿ EASY TO STORE ---- The hair pins come to you with a clear box, enable you to store them easily, also very lightweight, convenient to carry them when you go out.